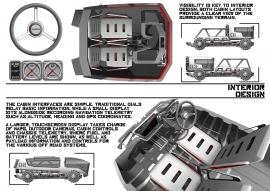 My entry into the Michelin Challenge design competition was my most testing project to date. I think I can say that it represents a great deal of what I believe (sometimes stubbornly) a creative process should be. It’s a strictly form follows function product that sets out to solve problems that arenÕt being addressed in a region of the world that few foreigners ever get to know. The aesthetic component in this case communicates to the user the capability and function that the trucks set out to fulfil, as opposed to just being decorative. I hope that the trucks serve as a better biography of myself as a designer than any paragraph could (actions speak louder than blah, blah, blahÉ), which is a perfect excuse to keep this short. 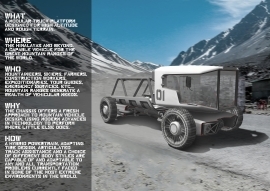 My name is Alfred Munkenbeck, I’m a 21-year-old undergraduate automotive designer at Coventry University in the UK, and I designed a series of trucks for the Himalayas, called Sherpa. 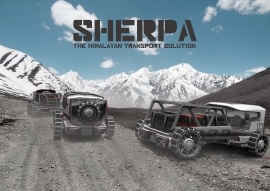 Sherpa represents the solution to a region of the world where transport is in much need of reform. Currently, the people of the Himalayas rely on antiquated transport that can no longer keep up with the growing tourism industry, particularly Everest climbing expeditions. Heavy diesel trucks struggle in the thin air, where the roads reach record heights above 18,000 feet. Poor road surfaces, dangerously narrow paths and unguarded cliff edges make driving through the Himalayas a perilous task in unspecialized transport, but as key trade routes, the roads are often unavoidable for the local population. Yaks and local porters carry much of the equipment to Everest base camp every year, their sure-footed nature once made them the best option to help with the arduous three-day hike. In recent years however, Everest tourism has spiked. Hundreds of climbers a year now attempt the summit within the short climbing season, and thousands of Porters and Yaks need to be hired to supply the base camp. The trail can no longer support the massive overcrowding, and the workers have become dangerously overloaded. 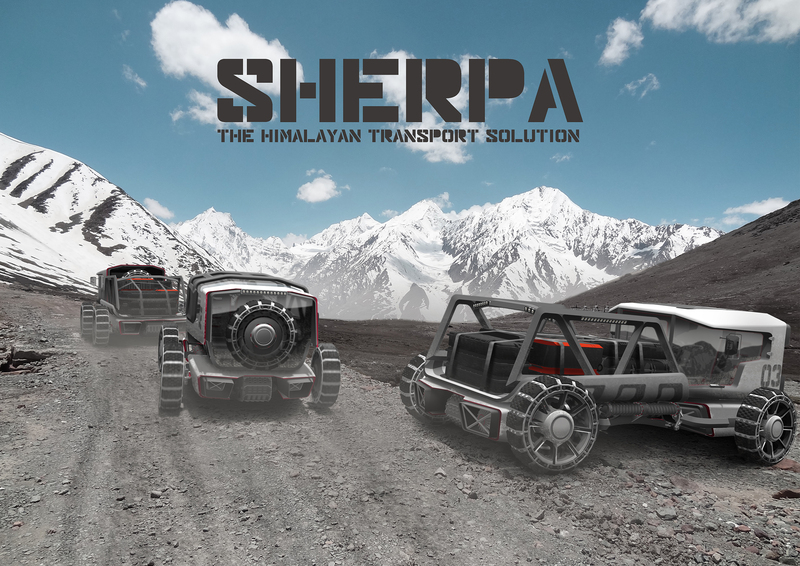 Sherpa is a proposed solution to the Himalayan transport problem. The narrow track makes it ideal for navigating mountain passes and small villages, while four-wheel electric hub motor drive suffers no loss of power in thin air, as opposed to a common diesel truck, which can become dangerously underpowered in higher terrain. 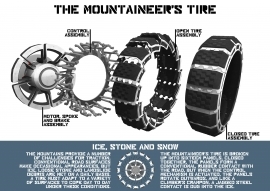 The tires are adaptable to any of the wide variety of off road surfaces that they’re expected to meet. The traditional rubber contact works for rock crawling and the occasional asphalt road, but for ice and loose surfaces, the 16 panels of the tyre can individually rotate 30¼, exposing a jagged steel edge designed to anchor the vehicle to the surface, just like the crampons of a climber’s boot. The airless design adds durability, and the 16-piece construction means that individual damaged sections can be replaced on the tyre without the need to remove the entire wheel. 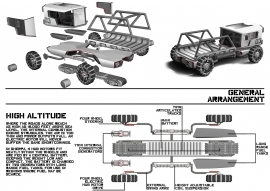 In addition, twin articulated tracks, similar to those on a traditional snowmobile, are positioned along the centerline of the vehicle and can be lowered to the ground to crawl up obstacles. This also ensures the vehicle can never be beached. Twin diesel generators, with no connection to the wheels, keep the central armored battery charged. They are air cooled to avoid radiator failures in extreme cold and they can be operated individually in case one fails. They are positioned between the front wheels where they can be easily serviced and exposed to the fresh air that they need to run and stay cool with. Twin 70 liter fuel tanks positioned between the rear wheels are designed to support the generators for months at a time in environments where diesel may be scarce. 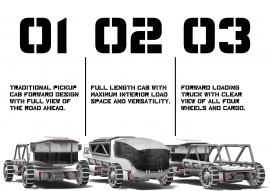 A choice of three body styles makes the vehicle adaptable to the many needs of Himalayan drivers. 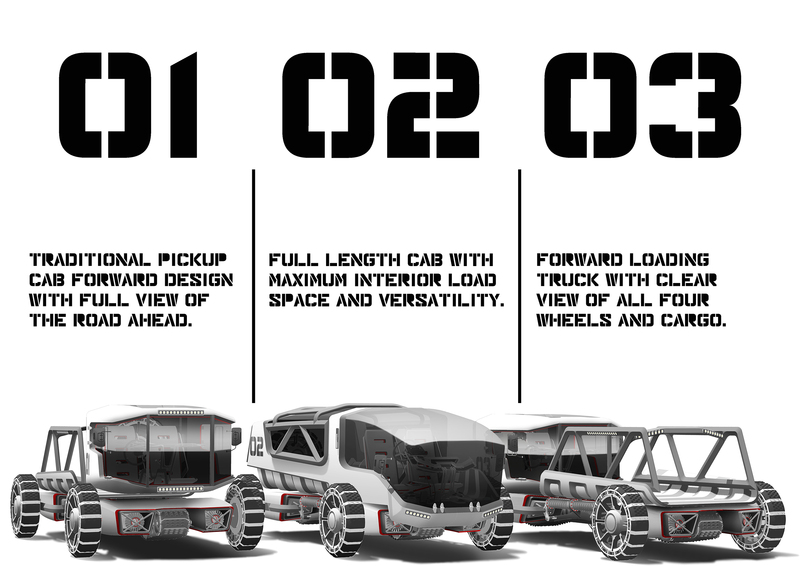 The full-length cab variant hangs the driver’s seat over the front of the chassis, making full use of the potential load space. 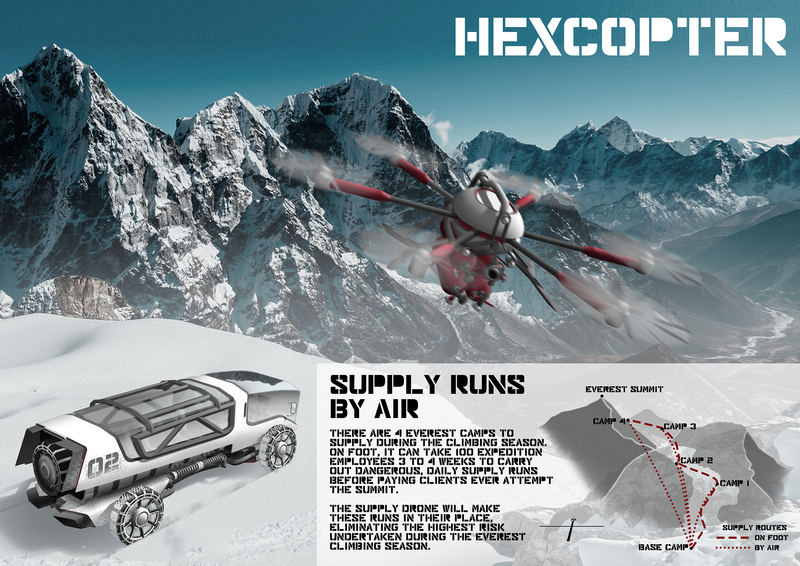 This leaves the remainder of the cabin open to potential as cargo space, living quarters for two, additional seating for six or even facilities for emergency evacuations, where the cabin can be pressurized to treat victims of altitude sickness where there are no nearby hospitals. Two open bed pickup variants are also available, one with a traditional rear load space, and another with a front load space, ideal for situations where visibility of all four wheels is key. 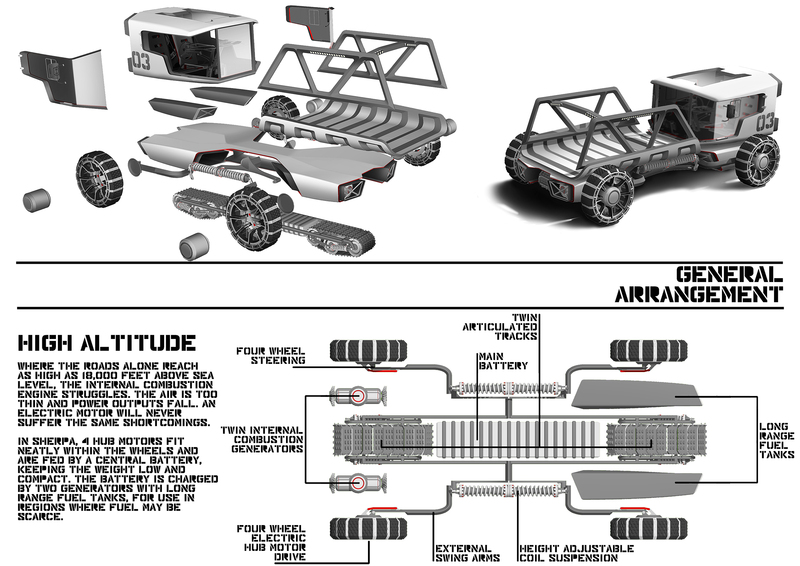 A six-rotor drone, designed to carry loads up to 40 kilograms, takes over when the truck can go no further. Prior to Everest climbing expeditions, several tons worth of supplies need to be brought up to 4 different camps on the mountain. Without ever summiting, hundreds of local expedition workers spend weeks supplying the camps before paying clients ever attempt the summit. It is the most dangerous undertaking in the entire Everest climbing season. The truck cannot make these runs in their place, however the drone can. The drone could make dozens of supply flights in a day, far quicker than a team of professionals could on foot and at far less of a risk. The drone could even map the terrain ahead, and the operator could identify hazards from the air without any risk to human life. This advance in safety could ensure that we never see a repeat of the disaster of April 2015, in which 19 people were killed when an avalanche struck during a routine supply mission. 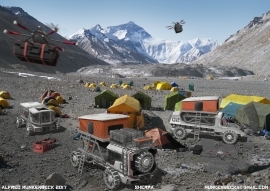 Designing for one of the world’s most extreme environments presents a lot of challenges, and it demands a massive wealth of function driven design solutions. 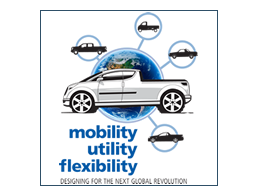 The result is a vehicle worthy of thousands of regions around the world. 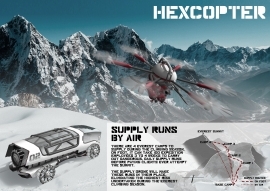 Designing a vehicle that can perform as an ambulance on base camp means it will never have trouble performing the same function in Chamonix. Similarly, if it’s worthy of construction work in Tibet, then it’s more than capable of construction work in Iceland. So as a solution intended for a very specific region, Sherpa is inherently worthy of a far wider audience, recognizing needs for safety, durability, functionality and longevity.